It is a small muscle situated on the lateral part of the dorsum of the foot, deep to the tendons of extensor digitorum longus.It is the only muscle on the back of the foot and forms a fleshy enlargement anterior to the lateral malleolus. Which enter digits II, III and IV. The tendons join the lateral sides of the tendons of the extensor digitorum longus. The extensor digitorum brevis is connected to a irregular area on the superolateral surface of the calcaneus lateral to the tarsal sinus. From the anterior portion of the superior surface of calcaneum. 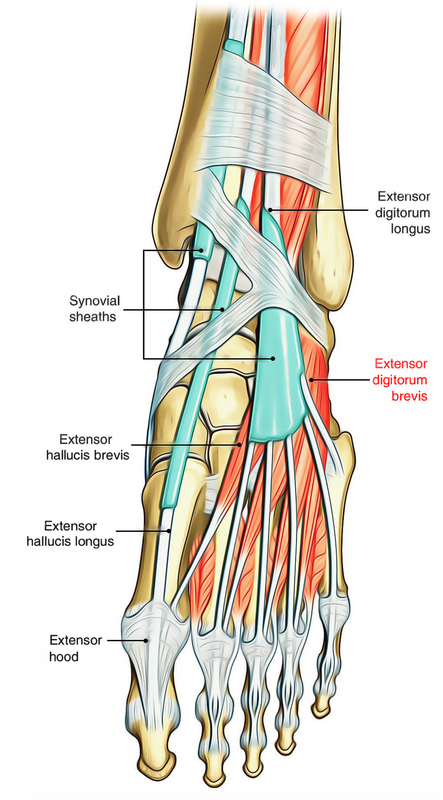 The extensor hallucis brevis originates in conjunction with the extensor digitorum brevis. Its tendon connects to the base of the proximal phalanx of the great toes. The muscle splits into four tendons for the medial four toes. The lateral three tendons connect the lateral side of the tendons of the extensor digitorum longus to the second, third, and fourth toes. Medial part of the extensor digitorum brevis, separates or becomes distinct early, which creates the tendon for the large toe. It is called extensor hallucis brevis. It is supplied by the deep fibular (peroneal) nerve. This muscle is supplied by the deep peroneal nerve, root value L5, S1. The skin covering the muscle is likewise supplied by roots L5, S1. The remaining three tendons extend the metatarsophalangeal and interphalangeal joints of second, third, and fourth toes, particularly when the foot is dorsiflexed. The extensor digitorum brevis extends the middle three toes through accessories to the long extensor tendons and extensor hoods. Extensor digitorum brevis will help extensor digitorum longus and extensor hallucis longus to raise the toes clear of the ground in running and walking. The muscle extends the metatarsophalangeal joint of the great toe and is supplied by deep fibular nerve. Place the fingers on the tendon of extensor digitorum longus as it splits into its four sections. When ever the toes are extended extensor digitorum brevis can be felt simply lateral and deep to the tendon. The tendons are difficult to trace distally as they end up being indivisible from those of extensor digitorum longus.